We guarantee the best prices on our commercial and industrial dry vapor steam cleaner systems and most other product we sell for up to 30 days after you purchase! If you find our product, brand new being advertised now on another companies website for less then you paid or less then you see it listed on our web site now, we will beat that price! even if you come back after purchase and show us the ad within 30 days of original purchase we will refund the difference. Does not include sales or specials hosted by Vapor Rino or our affiliated web sites after sale. You must provide proof in the form of a web site link to the sale item to redeem this offer. Free Shipping on all Vapor Steam Cleaner purchases over $100! NOTE: Expedited or express shipping is NOT free of charge. Standard ground shipping is 100% FREE for all NEW vapor steam cleaner orders over $100. Generally we send our Vapor Rino systems using UPS Ground shipping. Ground shipping can take between 5 to 7 days from the time your commercial steam cleaner leaves the warehouse. Shipping time may vary slightly but often times our products arrive ahead of schedule. Shipping time is based on when the item leaves the warehouse, not time of purchase. EXPRESS SHIPPING is NON REFUNDABLE. We offer FREE GROUND SHIPPING only within the lower 48 US Continuous States on some systems. Orders outside the lower 48 US States may have additional shipping charges. Most items ship out of the warehouse the next business day not including Saturdays & Sundays or holidays. Express shipping is available on most of our commercial steam cleaners. Express times are calculated from the time the items leaves the warehouse, not when the order is placed. Example, if you place an order late on a Friday afternoon the item will not ship out until Monday or the next non holiday business day. The express time would be calculated from that day or the day the warehouse is able to ship the order out. If you are unsure, feel free to give us a call. See shopping cart for more information or give us a call. Ground and Express charges will be higher in Alaska and Hawaii. Steamers are shipped using UPS although there may be times another carrier could be used. Please open and use your steamer when you receive it to make sure everything is in working order. If you receive a defective steamer please call us right away. Powerful Limited Lifetime Warranty on Vapor Rino's: ( See Warranty Here ) Powerful Limited Lifetime Warranty Summary. Covers our new full commercial and industrial vapor steam cleaner systems from the time of the original purchase and is granted exclusively to the original purchaser. See the individual product page for the individual items warranty information or give us a call. The warranty covers the Lifetime of the boiler including heating elements, One Full Year Parts & Labor Coverage and 3 Years Parts Coverage! If your steamer stops working or is damaged just give us a call and we will direct you to the nearest service center. Warranty does not cover shipping costs. If service is needed the user is responsible for shipping. Please see individual product pages for specific warranty information. This warranty only applies to specific systems. This warranty does not cover Jenny systems or Mytee systems. Those units have their own warranty provided by the manufacturer. We Respect Your Desire For Privacy! Most people value their privacy. These days even more so. As Americans we believe you should have the right to shop for a dry vapor steam cleaner or any product without having your personal information harvested and sold to the highest bidder! It seems a person can not shop anywhere without the risk of their private information being sold to a third party. WE WILL NEVER DO THIS. This is our Vapor Rino Promise to you: Your privacy is of great concern to us so we will never share your personal information with any other party other then is needed to fulfill your dry vapor steam cleaner order, or any other order. We will never sell or distribute your personal information to anyone. It is a simple policy and it will stay that way. That is your Vapor Rino Guarantee! We care about your personal privacy and personal liberties. When a customer calls us every effort is made to match the right dry vapor steam cleaner to the costumer's needs. All dry vapor steam cleaner systems are fully covered under their respective manufacturers warranty. If you receive a dry vapor steam cleaner that is damaged, defective or even crushed in delivery you're in good hands! We will be more then happy to immediately have the defective vapor steam cleaner picked up and a new one sent out. We even pay to have the defective unit picked up (ONLY when you order DIRECTLY from VaporRino.com's online store) and sends the replacement dry vapor steam cleaner sent out with no charge for ground shipping. If you order from another vendor you will have to consult their policies on these matters. It is important that you try your new commercial steam cleaner right away when you get it. After the first week the only remedy is repair of the unit at the manufactures warranty holders choice, so open your steamer box and fire it up when you get it. Important tip: Keep your box and all packing materials. If you ever have a repair need you can repack the unit for safe transportation to a service center. Please call us and let us help you with your selection. We are more then happy to help. We do not accept returns for any reason. There are NO refunds for any reason and ALL sales are final. The internet gives you ample opportunity to research equipment. Simple dissatisfaction is not accepted as a reason for return. There are two primary reasons we have this no return policy. First, we only sell NEW units. If we accepted returns then we would be forced to resell vapor steam cleaner units that other people have used. We want you to know that when you order from us every dry vapor steam cleaner is factory fresh and brand new. We also want to avoid the 'try before you buy" customer or the impulse buyers that figure it might be fun to use it for awhile, try it out, clean their home or use it for a job and just send it back. Yes this happens. If you are not sure the item in question is for you we encourage you to shop around and compare quality and prices. We guarantee the BEST PRICE (more here) or we refund the difference. This policy is enforced to keep the quality high and our prices low. If you shop around you will find we offer some of the highest quality dry vapor steam cleaner machines for the best prices anywhere. There are many companies selling similarly powered steamers for 3 times what we charge. Others are selling cheap plastic units and marketing them as "Commercial" units. Always remember, you are fully covered by the manufactures warranty and if you receive a damaged or defective unit we have you covered! If you are unsure about your purchase feel free to give us a call. We will be happy to share our experience with you and will always strive to match you with the right product or dry vapor steam cleaner for your needs. Remember, there is no rush and no pressure. The internet provides you with the means to research as much as you like so you can make an informed decision about your dry vapor steam cleaner purchase. Also remember, you can buy now and shop around later. We offer our best price guarantee! Read more here. We are proud to offer a large selection of demo videos on many of the products we sell. These videos empower you by helping you making an informed decision. We also try to go out of our way to provide you with as much information on the dry vapor steam cleaner systems and their potential uses as possible. Most web sites only give you a small snippet of information. Just Renew It Industrial Supply strives to give you more! It is important to keep in mind that every cleaning situation is different. What may work great for 95% of users may not work in your situation. As with any product results may vary. See a complete listing our products here. 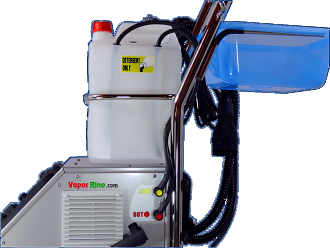 Even with our no return policy, there are occasionally foreseeable reasons why we may accept a return dry vapor steam cleaner or other item the buyer is responsible for a 20% restocking fee plus any of our original outgoing shipping fees. EXPRESS SHIPPING is NON REFUNDABLE. The returned item must be in new and original condition. The customer is responsible for packing the unit well and getting it back to us in new condition. Any damage to the dry vapor steam cleaner or other product, or worn parts may incur further charges. The buyer is also responsible for return shipping costs. No returns will be accepted without special approval. You must contact us first. The restocking fee is so that we can re-package and sell the steamer as used at a discount to another costumer. As always, we only sell new steamers as new. This policy insures that when you buy you will always know you are getting factory fresh new units. We offer the highest quality at the lowest prices. Though we strive for excellence in all we do occasionally there may be information on on our site that contains typographical errors, inaccuracies, or omissions that may relate to a dry vapor steam cleaner or other product. We ask your help in identifying such errors so that we may correct them and improve our service to you. We reserve the right to correct any errors, inaccuracies, or omissions and to change or update information at any time without prior notice. We strive to accurately display the colors of our dry vapor steam cleaner systems and other products that appear on the Site. However, as the actual colors you see will depend on your monitor, we cannot guarantee that your monitors display of any color will be accurate. Color tone, shades and textures may appear different in person. We strive to accurately display the colors of our dry vapor steam cleaner systems and other products that appear on the Site. However, as the actual colors you see will depend on your monitor, we cannot guarantee that your monitor's display of any color will be accurate. Color tone, shades and textures may appear different in person. The appearance and general design of Just Renew-It! LLC as well as the photographs of our dry vapor steam cleaner systems, other products and artistic elements on this website are protected by copyright laws. Elements of this website and the distinctive images and videos and the branding as well as logos are protected by trademark, unfair competition, and other laws and may not be copied or imitated in whole or in part. Just Renew-It! LLC Store shall not be liable for any special or consequential damages that result from the use of, or the inability to use, any dry vapor steam cleaner, product or materials on this site or the performance of the products. Applicable law may not allow the limitation of exclusion of liability or incidental or consequential damages, so the above limitation or exclusion may not apply to you. The liability remains on the individual manufacture and their policies of the individual products purchased or downloaded. JustRenewIt.com does not and cannot review all communications and materials posted by users about our vapor steam cleaners accessing our site, and is not in any manner responsible for the content of these communications and materials. You acknowledge that by providing you with the ability to view and distribute user-generated content on the site, we are merely acting as a passive conduit for such information or opinion and have no obligation or liability relating to any contents or user activities on the site. We do however attempt to screen postings about our products and dry vapor steam cleaner systems and reserves the right to block or remove communications or materials that we determine to be objectionable, questionable, inaccurate or offensive. If you spot an offensive post, please contact us with the location and content of the post. All comments, feedback, suggestions, email correspondence, and ideas submitted to our site or communicated to us by other means including social media sites such as Twitter and Facebook shall be and remain the property of Just Renew It LLC. Please note that your privacy is of great concern to us. We will never share your personal account information with anyone that is not directly involved with processing your dry vapor steam cleaner or other order. Materials and products on this site are provided "as is" and without warranties of any kind, whether express or implied. To the fullest extent permissible by applicable law, Just Renew It disclaims all warranties, express or implied, including, but not limited to, implied warranties of merchantability and fitness for a particular purpose and non-infringement. The individual products including dry vapor steam cleaner systems sold at our store are only covered by the respective manufactures warranties of said products. Just Renew It does not warranty products it does not specifically manufacture. You agree to defend, indemnify us harmless from and against any and all claims, damages, injuries, costs and expenses, including attorneys' fees, arising or related to your use of this site, product or dry vapor steam cleaner. References on this Site to any names, marks, products, or services of third parties, or hypertext links to third party sites or information are provided solely as a convenience to you and do not in any way constitute or imply our endorsement, sponsorship or recommendation of the third party, its information, products or services. Just Renew it is not responsible for the practices or policies of such third parties, nor the content of any third party sites, and does not make any representations regarding third party products or services, or the content or accuracy of any material on such third party sites. If you decide to link to or travel to any such third party sites, you do so entirely at your own risk.